Participant Media who co-acquired "Page One: Inside the New York Times" with Magnolia Pictures sent Diane Weyemann the Executive Vice President of Documentary Production at Participant and Wendy Cohen, the director of Digital Campaigns & Community to take part in the Q&A moderated by Pete Hammond. Wendy Cohen is also the founding editor for Take Part, a action inspired blog that focuses on getting people informed and involved to take action in today's hottest topics. Before we get ahead of ourselves you may be asking who is Participant Media. Apart from most film companies, Participant has a philosophy. As Dianne Weyemann points out, "the intent is to make both documentary and narrative films that are entertaining but also have a special message and will hopefully engage people around the issues." She continued by saying the hope is to get people to "think differently and get involved" after seeing any of their titles. Films like "Food, Inc.," "Countdown to Zero" and "Waiting for 'Superman'" all had special action plans incorporated into the releases and all had a point to drive home. Much like a Michael Moore documentary, Participant Media has a viewpoint they want their audience to not only walk away agreeing with but also wanting to get involved. Side note - I do think it is important to present an unbiased documentary covering both sides to a story but the issues/titles that Participant Media is producing are topics that more people should be aware of regardless of a particular bias or possibly skewed message. I guess what I'm getting at is Participant Media has an agenda and you should be mindful of that while watching their films. When asked how people have responded to their films and ad campaigns Dainne Weyemann disclosed that it depends on the topics and elements of the campaign. "All depends on how you want to get involved," she said. For example with "Food, Inc." the action plan is clear, eat differently. 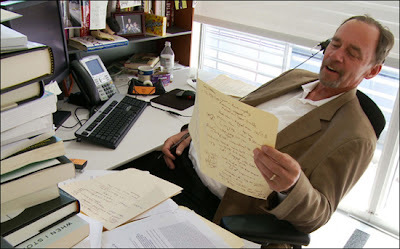 With other documentaries the call to action is not so cut and dry. More recently with "Waiting for 'Superman'" adding social media aspects helped getting people involved. Someone who watches one of their movies is able to immediately get involved through the internet, hotlines, social media i.e. Facebook and Twitter and also take action if they choose to. These campaigns have helped to get the issues out in the open and people talking about them in various formats. Considering that all of Participant Media's titles have had an action plan the question was asked what "Page One: Inside the New York Times" call to action is? Wendy Cohen was clear to stipulate that the main goal is to discover "how digital and print can co-exist together?" She continued by explaining that Participant Media is cooperating with ProPublica, Free Press and Take Part to open up dialogue on "how we will continue to fund investigative journalism?" Again the idea is to get individuals thinking, talking and questioning how they can support real investigative reporting and not just aggregate journalism. The groups have asked us all to "consider the source." A question that will hopefully help shape the future of media, media reform and insuring we can continue to finance quality investigative reporting. 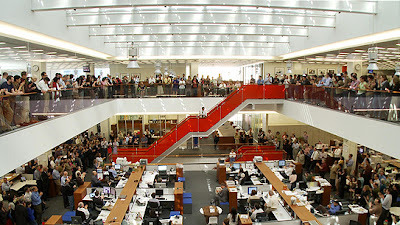 "Page One: Inside the New York Times" is one of the first documentaries produced by Participant Media that was not started from the ground up by the production company. Dianne Weyemann said she'd seen a rough cut before the Sundance Film Festival calling it, "dynamic" and then again at this year's fest where she knew they had to get it. Participant Media co-acquired the picture with Magnolia which is currently in limited theaters in New York and Los Angeles with select cities to be added in the coming weeks. Director Andrew Rossi filmed from the late part of 2009 through 2010 for fourteen months. Rossi had incredible access. Surprisingly enough the director had "complete editorial control" over what he was covering. Not only that but the director was extremely lucky with the content that broke over the course of filming. Remember that Rossi could not create dramatic news stories but he was there to capture them. One of the best aspects to 'Page One' is the characters director Andrew Rossi covered throughout the documentary. While this is a riveting look at the changing face of reporting and media it is largely a character driven story. The journalist's are the characters. Dianne Weyemann said Page One, "Could have been largely boring film but Andrew did amazing job of finding the right focus." She elaborate saying that Andrew Rossi originally only wanted to do a film on David Carr, but it was Carr that suggested Rossi "broaden out and do more." Women are sure to notice a lack of a female presence among the journalist covered. Weyemann explained that each journalist had to give full disclosure and unfortunately no women did. Despite a lack of women being covered, Carr really is an engaging person to follow along. 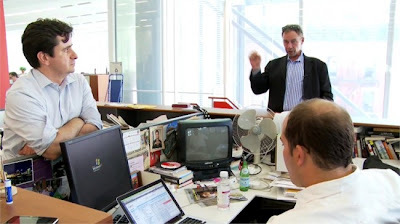 He is ahead of the curve and quick with his tongue and pen, a true journalist that really helped to not only propel the documentary along but give it some real human connection. On the horizon Participant Media have a more call to action documentaries on the docket. One about the limited source of water called "Last Call at the Oasis" and the other revolves around hunger epidemic in America. 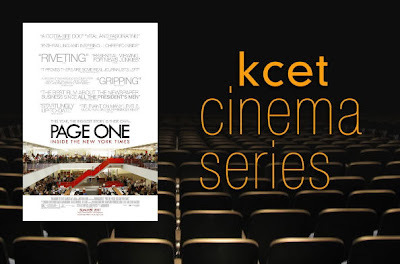 Coverage from KCET's Summer Cinema Series continues as it runs through August 2nd and stay tuned for my full review of "Page One: Inside the New York Times." Don't Talk, We Mean It!